The four year old Deuce sits in the Left Pavilion with his mom and dad. Late in the game, between innings, he comes down from his seat and dances. We love watching him dance and do his routine like he has a guitar on his little hands. He is often put on the big screen that now everyone including the players know him. He gets quite a round of applause. Here is Deuce with Jeff Weaver in the background. Here is Deuce and I during BP prior to one of the games against the Yankees. This is the game Jane of Confessions of a she-Fan attended. Deuce with Jeff Weaver in the back. I found Deuce and his dad at the All-Star FanFest. Dodgers got swept at St Louis. 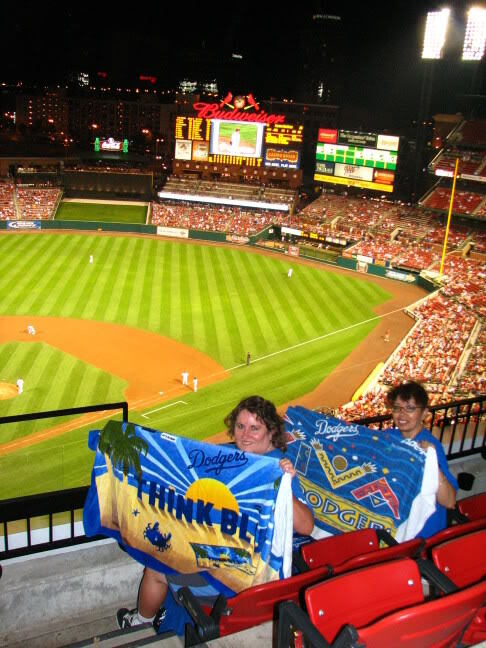 It reminded me of my last trip to ST Louis in 2006 when the Dodgers also got swept on a four game series. Padilla should have won that game. The bullpen just could not hold on to that win. Here is Linda and I in 2006 representing the Blue in a sea of red. Dodgers return home to play three games with the Giants and a four game series with the Mets! I hope they play better at home! James Loney Boblehead is Tuesday. Deuce is adorable! Sorry about your sweep – no fun having that happen – but hopefully your “bums” will play better at home. What I remember is that after a tough loss, they do come back with a good game. But I don’t know…they called up James McDonalds from Triple-A for tonight’s game. Either way, I’ll be at the stadium starting tonight! I hope they don’t (but they probably will)! Nothing worst than losing when you think is in the bag. I need a good win to get that off my mind. We are bringing JMAc from triple A for the game. I just hope JMac has found his MOJO in Albuquerque. We need a win!!! Deuce looks like a cute kid. I never saw him do his act. Is there a link somewhere that you can post where I can see him do his thing. Is the “don’t stop believing” guy still doing his thing in the eight inning. I remember seeing him when I was there for last years NLDS. I thought he was great. Pledge allegiance to the mask,That I’ll carry whskiy in my flask,And anyone to diss HU,I’ll leave a bloody mess with you,For we are family, you and I,3 Tears for you, we all shall cry,All day all night, our flags will fly,The Undead Army Till The Day We Die.ALL THE UNDEAD SOLDIERS COPY AND PASTE! I’ll see if I can find a video or I’ll make one myself. I like the “moider the Jints!” lol. I’ll tell that Mike who sits a few rows from me and is from Brooklyn. Always love it when young fans get intothe game at that age. Always a thrill to see their eyes light up when as ball is given to them, or they get a great accolade like getting on the Jumbotron. 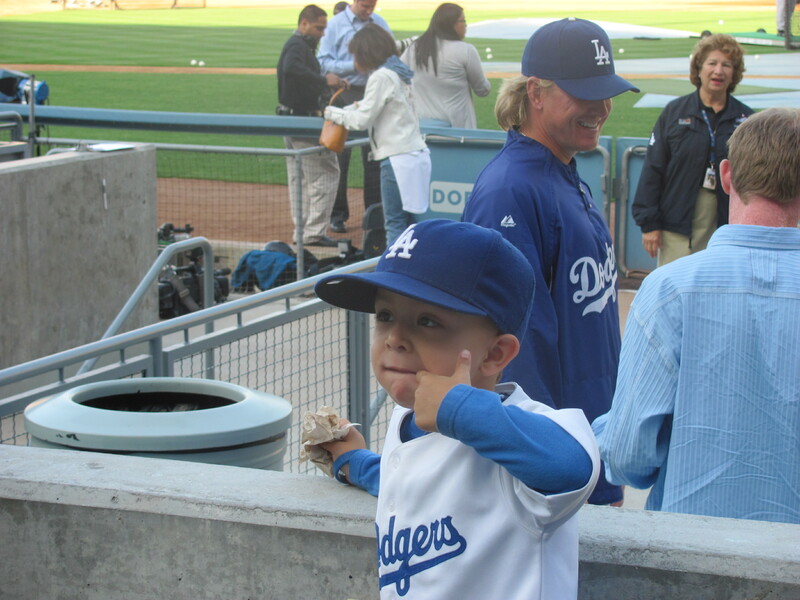 Who knows, he might grow up to be a regular fixture at Chavez Ravine in the future. Could get as popular as the old country guy during the Rays “Cotten-eyed Joe” dancing segment. Yes, I see our beach towels from that St. Louis episode made it on here! I liked both of those designs for the towels. Wish I had the VLD one myself. That was a four-game nightmare and it was repeated four years later! At the time we lost those four in 2006 we were 8 games under .500, I think, and still came back to tie for best record in the division at the end of the season. 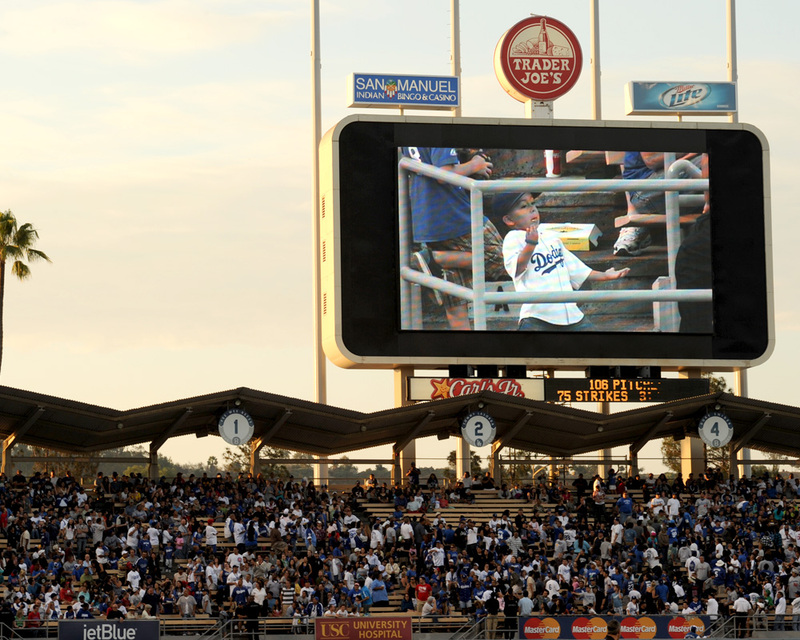 RaysRenegade, we don’t have a “Jumbotron” at Dodger Stadium, it’s “DodgerVision”! 🙂 And yes, it is always great to see a kid get into the game at that age. I love it. Reminds me of me taking my nephew to his first MLB game in 1993. Deuce got a signed baseball by Manny! That was cool of Manny to do that! Deuce is a regular now on Dodgervision and we all love to see him there! Other kids are copying him but there is only one Deuce! haha. See? that picture made it here! I’ll look for your kitty picture. I got extra tickets form a friend that can’t make the game but he does want this BBH. 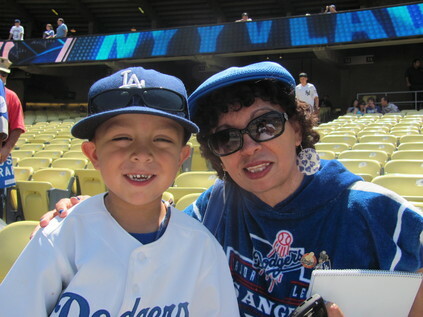 Is James Loney Bobblehead tonight so I’ll be scanning several tickets to get the bbH. getting there early for BP, god willing. I haven’t been to St.Louis since 1987. I need to get back there! DUECE is the best! Give him my regards. I’d like to see him in a little Bums outfit. Hey Mike! Our teams meet up starting today! 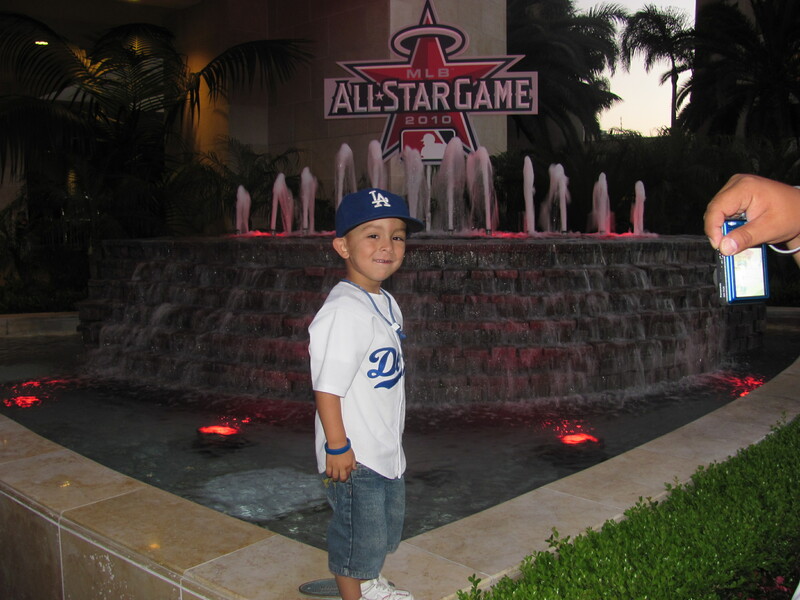 More pictures from the All-Star FanFest. Photos from Steve Garvey Celebrity Softball game to benefit ALS.